TSS was prestigiously awarded by the biggest Sonic site of the time, Sonic HQ, after we made the radical change during the Summer. Formerly a site called ‘Sonic Stadium’ (remind you of anything? =P), Sonic Dash has awarded TSS twice! This is the first one we received. Despite it being very very cheeky in design, Sonic-Team.tk is a nice enough website that was kind enough to hand TSS it’s very own award. The webmaster of sonictonic.tk offered TSS this award – the best Sonic site of 2003. P0wereD by Sonic offered us an award for being inventive and creative, which explains the ‘angel’ thing. And it’s true – despite all our hardships, TSS hasn’t given up. Far from it. More of an example to anyone who’s feeling down about their site. Chaos Hideout and p0wereD by Sonic were closely connected websites – if not actually made by the same people – so this double award came as a nice surprise. Chaos Hideout congratulated us on having a “great site”. Thanks so much! TPR Show host Biafra Republic handed us this rather funky animated award, so it took us a fair amount of time to figure out how to originally display it on this website! 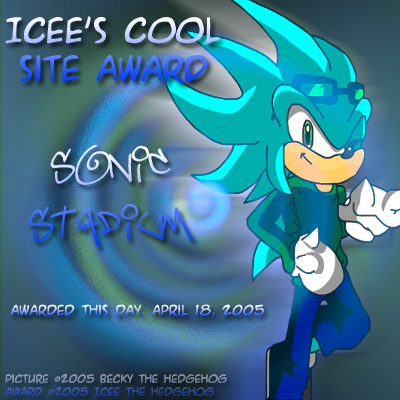 TPRInteractive’s awards show of 2003 thought that The Sonic Stadium was ‘The Best General Sonic Site’ and also gave us the ‘Most Webrings’ award. Cheers guys! The guys at Blue Sphere (Sonic Neo and co) handed us this ‘Pro Sonic the Hedgehog Site’ award. Thanks Blue Sphere. 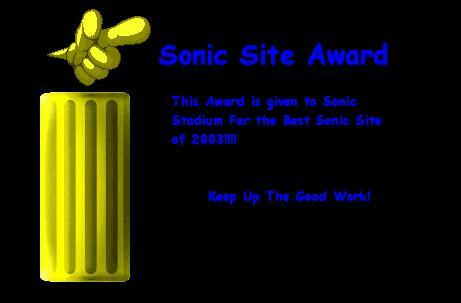 Knuxster’s website, Sonic Zone, decided to give this award to The Sonic Stadium. It’s very much appreciated, cheers! The webmaster of Sonic Communications, se37, awarded TSS for “all that wonderful news and music and images”. We’ll take your word for it, se37 – thanks! Real_Decimic, fellow SSMB member and webmaster of the Sonic the Hedgehog Worlds website, found The Sonic Stadium so informative that they sent us this award. In the wake of the Sonic Site Awards, it’s nice to get an award ourselves. Thanks a bunch. The webmaster of Ben’s Sonic the Hedgehog Messenger Club awarded The Sonic Stadium with a silver award for “excellent graphical quality, layout, information and features”, but our lack of updating that year stopped us getting the gold. Squik, aka Thunder the Hedgehog, sent us this award because TSS “kicks the crap outta every other Sonic fanbase i’ve seen”. Nice to be appreciated! No site was mentioned in conjunction with this award, so we can’t link to them… But the award is really cool – we love that flag. Icee hosts a forum called the Ice Cube, and whether it’s on behalf of that rather ‘cool’ (see what I did there?) forum or just because he’s a nice lad, we received an award that made us ‘shiver’ with excitement. As Dreadknux used to say (and for the purposes of milking the pun some more), ‘Stay ICE’. The webmaster of a site called ‘Mega Nintendo’ handed us their top award! Unfortunately, the Mega Nintendo site since went a little weird – it used to be a site about Sonic and Nintendo, then turned completely into a Sonic site (yet kept the name) and then decided to nick a ton of TSS’ images and content word-for-word. I guess we were quite the influence eh? Cheers for the award all the same. The first annual Sonic Wrecks Awards, or “Handies” as they’re known, seemed to favour The Sonic Stadium this year, with this website winning the most awards. Even though this place needed a lot of work at the time, we still won the “Best Resource” award, as well as the “Best Overall Sonic Website” gong. SONIC NEWS also won the “Most Essential Service” category too, giving us all a bunch of beaming faces. Thanks guys! We cleaned up at the 2006 Sonic Wrecks Awards, nabbing four gongs! Many of these were dedicated to our news portal, Sonic News – unfortunately The Sonic Stadium website itself wasn’t doing too well in the way of updating itself (and Sonic News was a separate minisite at the time, which didn’t help). This meant we eventually got what was coming to us and earned the Big Boot Award, for “Super Websites that are Suffering due to lack of updates”. On the bright side, it’s another award! A kick in the bum indeed, but all in good fun. In 2007 The Sonic Stadium went through a bit of a lull period – updates weren’t getting done and Sonic News was the only thing pretty much going for it. Despite being in the running for a few more categories, TSS won two awards at the Handies, which was a great honour considering how much the site actually got updated. At least we survived the Big Boot Award this time, losing out to Sonic HQ (damn). The most pleasing thing was we were voted the Silver Hand for Contributions to the Community. It was awesome to see things like the Summer of Sonic and other TSS projects recognised. Cheers AAUK and to all who voted!